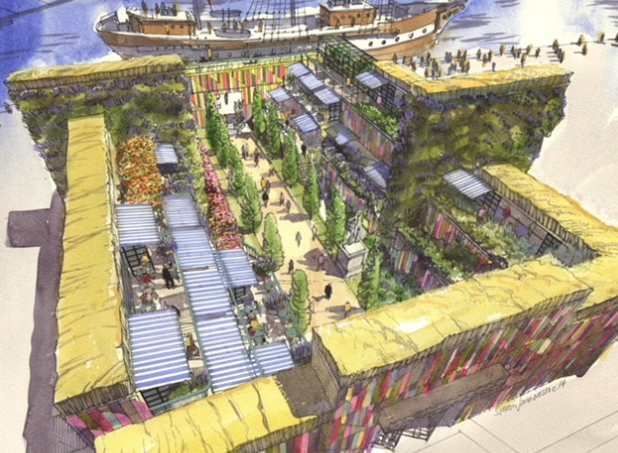 Ambitious plans by RHS Chelsea Flower Show gold medal winning garden designer Diarmuid Gavin have been unveiled, which aim to create a “majestic and unique” urban garden on the banks of the Tyne on Gateshead Quays. The Urban Garden, which could be the largest container garden in the world, is planned to open in June 2018. The plans for the Gateshead Quays Development aim to bring together cultural and social initiatives working alongside local businesses, creating a key visitor destination for the 2018 Great Exhibition of the North and the NewcastleGateshead World Transplant Games in 2019. Diarmuid Gavin’s ambitious designs comprise a walled terraced garden, created from 90 shipping containers set in rectangular form. Inspired by the concept of a traditional walled garden, this urban oasis is planted with a wide variety of ornamental and agricultural species with internal vertical walls covered with a range of herbs, vegetables and ground-cover species. Large specimen trees will create dramatic structure, with six-metre high, shaped Carpinus forming the primary architectural planting dotted throughout the multiple levels of the scheme, while groves of multi-stemmed birch will emerge from underplanted drifts of flowering perennials. It’s estimated that over 200,000 people could visit the site annually. Up to 100 people would work at the site and the garden would be maintained by National Trust gardeners and volunteers. The project is a commercially funded scheme which will be funded by private investment and commercial opportunities which is being raised by the developer. Gateshead Council already has ambitious plans for Gateshead Quays which includes a 12,500 seat regional arena and conference and exhibition centre plus hotel, bars and restaurants which is due to open in 2021. Gateshead Council Leader Martin Gannon said; “These are very exciting proposals which would certainly further energise Gateshead Quays. The planning application for the scheme will be considered by Gateshead Council’s planning committee later this year.